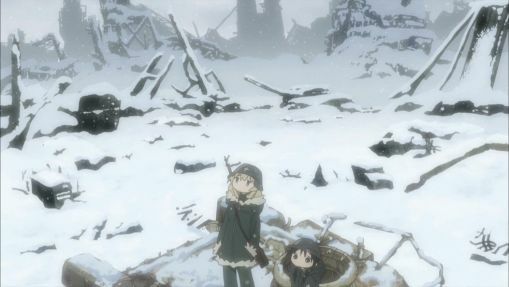 As we venture into the Girls’ Last Tour odyssey, we can’t help but fall in love with the atmosphere of the show. From its simple background art to the slice of life storyline, the charm lies in the unique way it presents us a post-apocalyptic world. With its’ moe-like characters and down to earth depictions of Yuuri and Chito, this title is a breath of fresh air for anyone looking for a revitalizing and straightforward series. 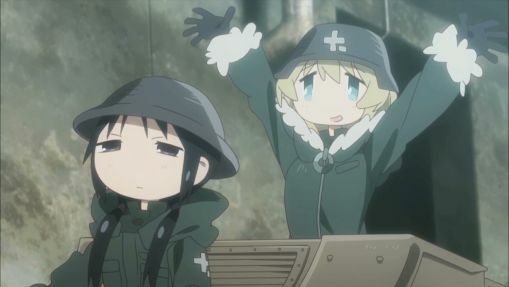 In contrast to the bleak state of the world, Chito and Yuuri can keep a level of normalcy and optimism which keeps the viewer smiling. Their friendship is one of camaraderie and affection. While Chito tends to be the logical one in comparison to Yuuri’s air-headed personality, they complement each other by making up for what the other lacks. They aren’t afraid to fight with one another and tend to be open about their issues. They’re just two girls at the end of the world trying to survive. 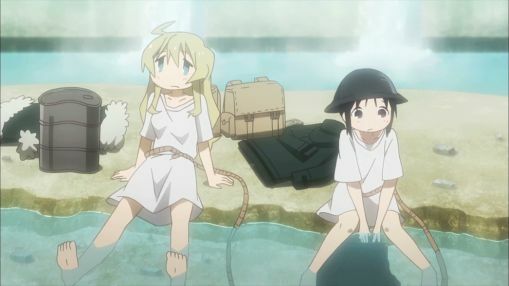 This slice of life anime deals with its post-apocalyptic nature setting the show’s atmosphere to the girls’ simple nature. The pacing of the storyline lets the world of the series unfold at a natural pace. As the characters progress through their journey, we’re given a semblance of a regular life in this post-apocalyptic world. We are passengers in Chitos’ and Yuuri’s story as they ride along with their Kettenkrad motorbike and just live their lives. We could not NOT mention the fact that these girls are adorable moe blobs! Their cutesy design is a divergence to the grim environment in which they dwell. However, this doesn’t detract from the beauty of the show and its overall message to make the most out of your situation. What do you do when it’s the end of the world? That’s easy. You hang out with your best friend… she might be a bit irksome but hey… no one’s perfect! 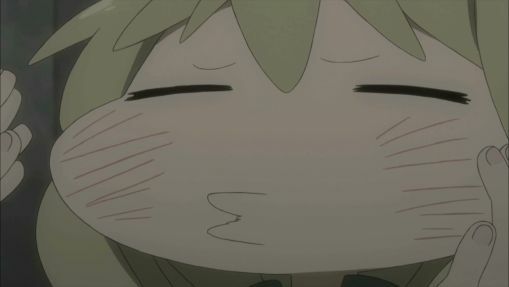 Want More Girls’ Last Tour? If you want more of this adorable due the show is streaming on Anime Strike every Friday at 9:00 AM CT! 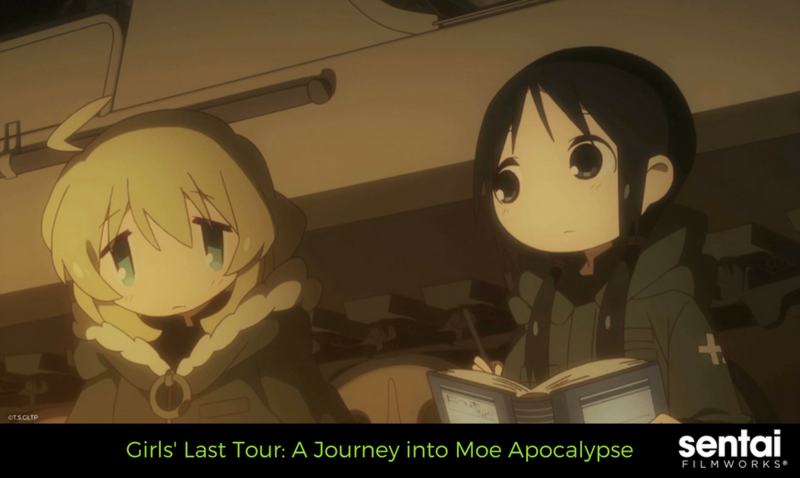 Tell us your thoughts about this moe apocalypse by @sentaifilmworks on Twitter and Facebook!